NetEnt will publish its new slot, Neon Staxx, on the 24th of June. The game is an interesting deviation from the norm, as it is played from a different point of view compared to any other slot games. Neon Staxx, as the name suggests, is a neon-colored, retro-style slot with 5 reels, 4 rows and 40 fixed lines. There are 243 ways to win, and special features include symbol-substituting Wilds, a free-spin feature, stacked symbols, and a feature called SuperStaxx. Wild symbols with substitute other symbols (excluding Scatter symbols) that you might need to win. 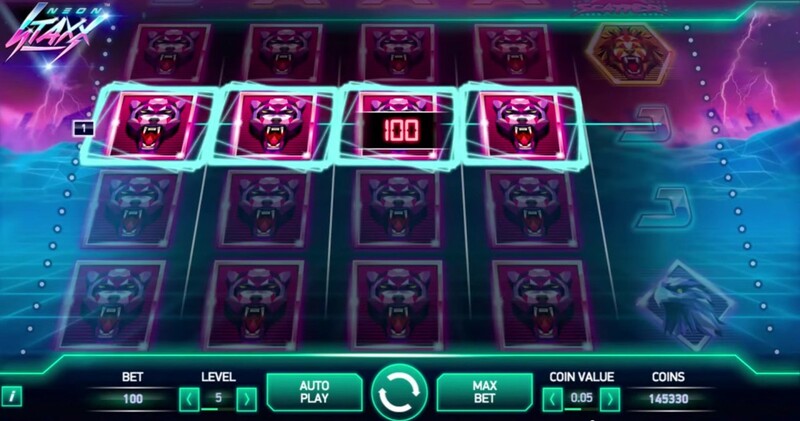 Getting 3-5 Scatter symbols will reward the player for 10-20 free spins. The SuperStaxx feature turns a whole reel into the same symbol. The feature can activate any time, and it can even turn all reels to the same symbol, giving out big wins!